Those of us who used floppy disks back when they were a common thing, were taught about their sensitivity. The data on a floppy is stored magnetically, and that made them very sensitive to magnetic and electromagnetic fields. Speakers, fridge magnets and even magnetized paper clips were deemed dangerous, and could wipe all or part of the data stored on a disk quite easily. But by 1998, the floppy disk’s days were numbered. that year, after nearly two decades of floppy drives being standard equipment on personal computers, the first model without one shipped, and was soon followed by others. Newer, higher capacity technologies such as the Zip Drive, and the writable CD and DVD were ultimately more convenient and replaced the floppy disk in common use. After a few years, those formats also declined in favor of USB flash drives, memory cards, and cloud storage. And even magnetic hard drives are now being replaced in some cases by non-magnetic Solid State Drives. And so, by 2007 when the smartphone really started to become a popular gadget outside of geekdom, whole new generations of computer users (and some older ones) had long forgotten about magnets being a potential danger to data. And by and large, so had the gadget makers. No longer having to worry about what magnets might do to a user’s data, smartphones were loaded with speakers, microphones, and magnetometers that act as compasses. Tablets and laptops also started sporting strong magnets. Apple’s laptops, such as the MacBook Pro, have a strong magnet placed along the front edge of the computer to hold the screen down when in the closed position. Most tablets, similarly, use magnets to hold any case lids or covers against the screen when not in use. None of this is a problem with modern technology and storage systems, but the lack of caution can mean serious problems when someone uncovers an old floppy disk and places it against a new device, not considering what the magnetic accessories might do to the data stored inside. As a result, we end up with an unfortunately large amount of disks that might have held some interesting data at one point, but were accidentally rendered unreadable. And so, it’s important to remind people that, should they come across an old floppy disk, and they would like to save the data, they must be careful where they place it, and what newer devices come into contact with it. Old floppies should be kept as far away from strong magnets as possible. 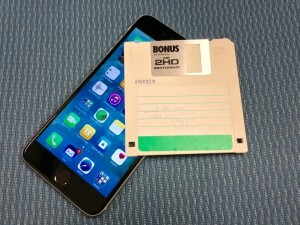 And smartphones, tablets and even modern laptops shouldn’t come within 6 inches of floppies or any other magnetic media that could be easily erased. While I’m on the topic, I’ve noticed that 3.5″ floppy drives are becoming harder and harder to find. Some places still sell a reliable USB-based drive, and I recommend getting one if you have an old collection of disks and would like to eventually migrate the data. Eventually, 3.5″ drives will become as difficult to find as the 5.25 inch,or even worse, the 8-inch variety.